Were the Taliban behind the actions of a rogue Afghan army soldier who allegedly killed three British servicemen overnight while they slept? The militants claimed that the episode, which included a shooting and a grenade assault, was a premeditated attack, part of a new strategy to push back against coalition forces spread out in record numbers across southern Afghanistan's battle zones. Although the inside-job claim remains unconfirmed, the killings cast a shadow on the quality and reliability of Afghan security forces deployed in a hostile region where they are being groomed to take the reins of their country's security and wean themselves from dependence on Western troops. The assault took place at a British military outpost in Nahr-e-Saraj district, a Taliban stronghold near the provincial capital of Lashkar Gah. A senior Afghan National Army (ANA) officer identified the gunman as Talib Hussein, 23, a member of the ethnic Hazara minority from Ghazni province who had served for less than a year, mainly in remote swaths of Helmand province, far from home. After killing a major in his bed, the suspect fired a rocket-propelled grenade at the base's command center, killing a British lieutenant and Nepalese Gurkha and injuring four others, before he managed to flee outside the wire. A manhunt has ensued even as the Taliban assert he is now with them in a "safe place." It's a strange sequence of events, given how brutally the Hazara were persecuted under a Pashtun-dominated former Taliban regime that massacred thousands. Today, Hazara Taliban are all but unheard of because of the history of bad blood and differences of orthodoxy: Hazaras are Shi'ite Muslims, considered heretics by the rigidly Sunni Taliban hard-liners. To explain the anomaly, General Ghulam Farook Parwani, the deputy corps commander for the ANA's southern forces, alleged that Hussein was a habitual hashish smoker  a widespread phenomenon within the ranks. Even if that's true, however, it hardly provides a clear motive for the deadly outburst. This is not the first time Afghan security forces in Helmand have turned against their foreign partners. 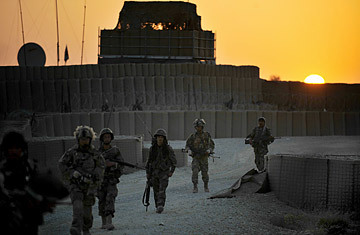 In November, five British soldiers were gunned down by an Afghan policeman they were training in Nad-e-Ali district. There were reports the policeman might have lashed out after being repeatedly insulted. But while these cases are isolated, they are sure to amplify existing anxieties felt by NATO military planners over the status of Afghan security forces, which are expected to shoulder greater responsibility when foreign troops eventually start to withdraw. The Afghan army is held in higher regard than the national police force, which is widely deplored as corrupt and erratic when put to the test. Still, billions in American taxpayer dollars appear to have yielded less-than-stellar results. The Afghan forces' shortcomings were cast in sharp relief in February when U.S. Marines launched an offensive to clear the Taliban out of Marjah, the opium-poppy-trafficking area in central Helmand. Despite a game fighting spirit exhibited by many of the Afghan troops involved, U.S. officers grew more and more frustrated with the ANA's inability to follow complex orders and coordinate attacks against a determined foe. As the campaign wore on, it were largely consigned to a secondary role. Much to the dismay of American officers, these troubles persist in parts of Marjah where the Taliban have since regrouped with help from outside fighters trying to chip away at the Marines' hard-won gains. The summer fighting season is now in full gear across the south. In a recent 24-hour stretch, eight American troops died in a series of attacks that included a car-bomb assault and a gunfight outside the Kandahar city police compound. In Marjah, where fierce firefights and roadside-bomb strikes occur every day, the ANA often appears to be yet another burden for U.S. forces, with problems ranging from insubordination to the careless handling of weapons. During a morning patrol on the edge of town late last month, for example, a gunshot rang out within seconds of U.S. troops' stepping outside the base, sending Marines ducking for cover. The discharge, however, was accidental  an Afghan soldier had fumbled his rifle. It wasn't the first time something like that had happened. The love-hate relationship was better illustrated during a route-clearance operation later in the week. The three Afghan army soldiers who accompanied Marines were useful when a private compound with women and children needed to be searched for weapons. With respect to the deeply conservative mores of the area, Marines stood back while the Afghans talked reassuringly with the family and checked things out. That same day, however, the men brazenly disobeyed the orders of a Marine officer when they refused to walk any farther toward a dangerous stretch of road. They simply stood their ground as he cursed up a storm and threatened to throw them into a nearby canal, a threat they could not understand. "These guys are gonna be in pretty bad shape when we finally get out of here," said a low-level Marine officer, shaking his head. "Most of them are a danger to themselves." He wasn't entirely kidding. In the case of one front-line unit based in northern Marjah, three attached Afghan soldiers (at last count) had shot themselves in the foot and one in the hand. Whether the shootings were intentional or not, the upshot is that such incidents usually result in quick transfers out of the battle zone.